The LT&SR derived their chief income from passenger traffic. Goods traffic on the Tilbury line was a secondary concern, the commuter service to and from Southend being the mainstay of the company’s finances. With a total length of under 80 miles, and a locomotive stock not quite raeching 100, it wasa small concern, but its importance far exceeded its size. It is chiefly with modelling in mind that this book has been prepared. 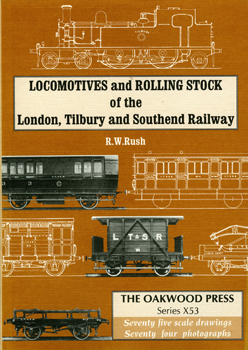 Hence the line drawings of most of the rolling stock, prepared mainly from photographs and published dimensions. Luckily a good deal of detail as to numbering, painting, etc. has been handed down and photographs are fairly plentiful on the whole. A5 format, 75 scale drawings and 74 photographs.